Our range of products include laboratory sterilizers, laboratory eto sterilizer, medical laboratory sterilizer and lab sterilizer. Laboratory Sterilizers manufactured by our company is in huge demand among the medical clients. At present, in various laboratories of leading hospitals, our products are mostly used. We are always concerned of customer satisfaction and thus we have become able to produce superior quality product at the best price. These are pressure type steam jacketed double/triple chamber sterilizers made from Stainless Steel. Inner Chamber is made from 304 quality 10 swg. S. S. Sheet, steam jacket is made of 14 swg S. S. Sheet and the outer cover in made of 24 swg S. S. Sheet. The lid and ring are also made of suitably thick S. S. Sheet. All the joints are Argon Arc welded. The lid is closed by wing nuts/Radial Arm arrangement. A joint less Neoprene Gasket prevents any leakage. The complete structure is mounted on strong tubular frame. The outer chamber of the vertical Sterilizer is however made of Mild steel. The Boiler, made of corrosion resistant 18/8 quality S. S. Sheet, suitable to the size of the sterilizer, is fixed below the working chamber placed on the tubular frame, with suitable immersion heaters and a low water protection device. A perforated S. S. Tray is provided. The lid is made of Gun Metal, covered with S. S. lining. An automatic self locking Device is provided. A working pressure of 15 - 20 Ibs psi, (adjustable) can be created hydraulically tested up to 2.5 times of the working pressure. Neoprene Gasket prevents the loss of pressure. The Jacket is insulated with glass wool to minimize the temperature loss (maximum temperature 126 DC approximately). 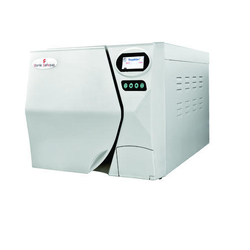 The Sterilizers are electrically operated on 440 volts A. C. supply, three phase. A control box on the side, houses the 'MAIN', 'LOAD' and 'LOW WATER' indicating lamps with their toggle Switches, a pressure control knob and CUITLER HAMMER MAGNETIC Contractoer. Our Laboratory Sterilizer is supplied with suitable length of wire in Plastic Molded flexible casing and Instruction Manual. The Vertical Sterilizer operates on 220 / 440 volts A.C. supply. In manufacturing of Laboratory ETO Sterilizer of superior quality, there is no company which can be compared with us. We always pay attention towards designing the best quality Sterilizers which can be used in laboratories for a long time. These laboratories are made of stainless steel of pure quality and at present we are one of the leading manufacturers of these machineries. We make Laboratory Sterilizer available at industry best price with no compromise on the quality part. If there is any customized requirement we are glad to accept such order and fulfil it in given timeline. Proper packaging is done for safe delivery. We are offering a wide range of Laboratory Sterilizer. We design and supply high quality laboratory sterilizers that are used for sterilizing medical equipment and instruments. Available in variety of designs and size specifications, our sterilizers have been designed as per the industry standards and can be availed at most reasonable prices. We have emerged as the top manufacturer of Medical Laboratory Sterilizer and till date we have successfully served to lots of customers with our quality products. Our professionals pay attention towards manufacturing the medical sterilizer following international standard. These machinery are easy to use and possess long life. Hence, our products are being considered as the most preferred one in the industry. The machine is packed in hard damage proof pack for making safe and secured delivery to the client. Customer satisfaction is important for us and we are ready to accept customized orders for Medical Laboratory Sterilizer. In Laboratory Sterilizer, glassware and utensils must be clean and sterile before use, culture media must be sterilized after preparation, after use cultures must be made safe before disposal (e.g. before transportation to an incinerator) and equipment should be decontaminated before re-use. 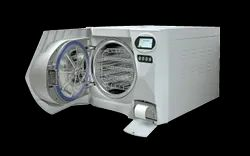 SSQ offers a wide variety of steam sterilizers (autoclaves) for laboratories. We are glad to introduce ourselves as top ranked manufacturers in the field of medical equipment. 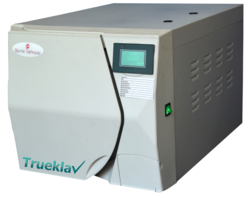 we emerged as one of the reputed supplier of Lab Sterilizer and till date we have delivered top quality product. This machinery is made using high quality raw material which is sourced from licensed vendors in market and hence these are durable too. our products are available in the market at an affordable price. quality check is done by our experts before forwarding it to shipping department. damage proof package is done to make final dispatch to clients.